Clydebank lies on the ruins of what used to be the ancient Roman Antonine Wall, which was the boundary of the Roman Empire’s most northerly point. Like many of its neighbouring towns, Clydebank expanded massively during the Industrial Revolution due to its thriving ship building industry and the town has several monuments and museums commemorating its proud nautical past, including the distinctive Titan Crane. The cooking technique used by the Hog Roast Clydebank team also has a longstanding association with the past, but in keeping with the spirit of the town, we have developed our methods, menus and machinery to continually expand what we offer to achieve the perfect balance of providing contemporary cuisine prepared using traditional techniques. If you want maximum flavour and succulence from your meat, spit roasting is the only way to cook it and if you want it cooked to perfection, we are the most qualified people to do it. Over the years we have honed our technique, expanded our repertoire and developed our menus to allow us to provide food worthy of any special occasion and the highly professional level of service to match. From an informal help yourself buffet, to a structured 3-course meal with full table service provided by Hog Roast Clydebank’s experienced events staff, we have catering solutions for all occasions, tastes and budgets, including canapes, an exciting array of side dishes, vegetarian options and themed menus that are guaranteed to get your party into full swing. 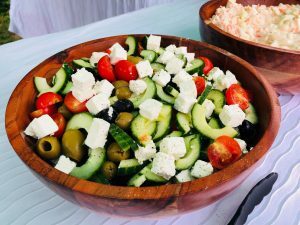 All of our ingredients are sourced from the best local food producers in the area and we spend a great deal of time researching the freshest produce available to ensure we present only the highest quality food to you and your guests on the day. We know the origin of everything we prepare for you and we are very passionate about providing only the very best ingredients. You may have never considered hiring a hog roast company for an event but with so much to offer you and your guests, the Hog Roast Clydebank team will definitely leave you pleasantly surprised with the scope of our menus, the quality of our food and the friendly and professional service you will receive from beginning to end.